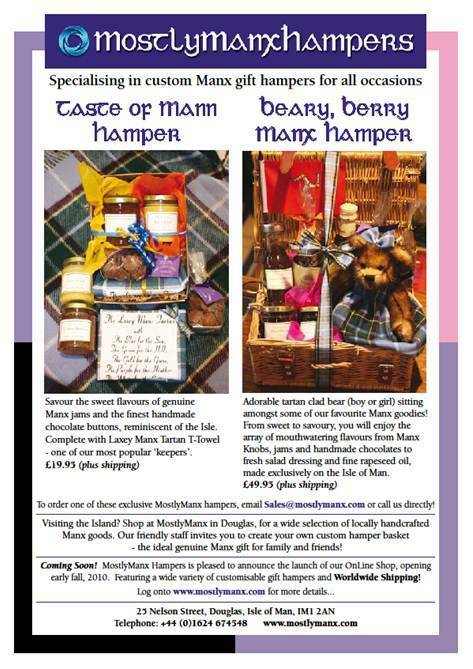 MostlyManx Hampers at the IOM Food and Drink Festival! The Isle of Man Food and Drink Festival will mark the first official event for MostlyManx Hampers! Make plans now to visit our stands at the Manx Food Exhibitors Marquee in the Villa Marina Gardens, September 25th & 26th between 11:00am and 5:00pm each day! For that special gift - created using genuine Manx produced edibles and special keepsakes, look no further than MostlyManx Hampers! We offer a wide assortment of customisable gift hampers perfect for any occasion. With advance order and delivery options available, we are commited to making your gift giving experience as pleasurable, simple and well received as possible. SATURDAY ONLY - Don't miss the Arts and Crafts portion of this event, which will take place on September 25th from 11:00am to 5:00pm. MostlyManx will occupy the entire Upper Arcade with tables featuring our talented Manx artisans! Come on by, watch their demonstrations and take the opportunity to purchase some of their unique and handcrafted specialty items. For more information about this grand, fun-filled Island event that is sure to delight the entire family, please visit the link below! MostlyManx is grateful for your support of our local artisans and Manx produced goods.